I’m not one for awards show because quite honestly I think they’re silly. It’s purely subjective, unlike a sporting event in which a score at triple zero or a ground out at the bottom of the ninth determines the victor. No, in these awards, artist compete against each other while somebody arbitrarily determines who the best this or the best that. Best song of the year in b-flat, best adaptation of a previously unread work, or whatever. I understand the importance the industry places on these awards and I also realize that I’m in the minority since it is very important to an awful lot of people who the best supporting actor was in 1977 – and no, I don’t know who that would have been, but it still doesn’t make it any less silly to me. This brings us to Daniel Day-Lewis’ performance in ‘There will be Blood’, a performance in which he was simply outstanding. Is it award worthy? Sure it is and he should get something for his cutting portrayal of ruthless oilman Daniel Plainview. Is he more deserving say than Viggo Mortenson in ‘Eastern Promises’ or George Clooney in ‘Michael Clayton’? That of course is debatable. Or even actors who weren’t nominated such as Tom Hanks in ‘Charlie Wilson’s War’ or Don Cheadle in ‘Talk to Me’. And who did Josh Brolin piss off? I say we put a bunch of actors in a room with a trophy and who ever walks out with it is the winner. Now that’s an idea. Daniel Plainview, in a word, is driven. We see Daniel early in his life, a lone gold prospector who manages to dig up a meager claim but breaks his leg in the process. Miles from anywhere Daniel drags himself, not to a doctor to fix his leg, but to the claim depot with gold in tow to cash in. No need to question the priorities of one Daniel Plainview. right hand man Fletcher Hamilton (Ciaran Hinds) is certainly a success at his vocation by any measure but not nearly the success that the hyper ambitious Plainview thinks he needs to be. Good fortune drops in on Daniel in the form of young Paul Sunday (Paul Dano) who lives somewhere in California that is ripe with oil and the land can be had for dirt cheap. Daniel’s interest is piqued but Paul will not divulge jack without cash in hand. After extorting a nice little chunk of change from Daniel, Paul divulges the location, under the threat of grave bodily harm should his claims prove worthless. No worries there as Daniel and young H.W., under the guise of hunting pheasant, travel to California and meet Paul’s family and his fanatically religious twin brother Eli who extorts more money from Daniel for the sale of their land as the prospector is certain that the land is fertile and worth mining for untold riches. Sure enough Daniel strikes black gold, though it does come at some personal loss, which sets in motions of series of events that will highlight the depravity, insanity, blind ambition, and pathology of Daniel Plainview and the ultimate price of his unrestrained greed. There is no doubt that Daniel Day-Lewis takes this film directed by Paul Thomas Anderson, who also directed Adam Sandler in the outstanding ‘Punch Drunk Love’, hoists it on his insanely talented shoulders and carries it to the finish line. Even if ‘There Will be Blood’ was a narrative failure, which it is far from, it would still be worth seeing just to witness how completely Lewis embodies this character and breathes him into life. Daniel Plainview it crazy to be sure, but his goals and ambitions are no different than anybody other person. It is the lengths that he is willing to go through to achieve his goals that set him apart and the effects that this ambition has on a psyche that is already badly fractured. I still think awards pitting artist against one another are unnecessary, but that doesn’t mean that greatness still shouldn’t be recognized. The rest of the film outside of Lewis is very good as well. Anderson places you in this unfamiliar world with a different set of values in a different time and immerses you within the culture. This is a film that is vast in its cinematic scope of sweeping vistas and large ideas, but full of small minor but important characters. Plainview himself is an anachronism of sorts, a character whose blind ambition and pathological desires could be construed as being a better fit for today in the early 21st century than in the pristine, albeit hypocritical early 20th century. 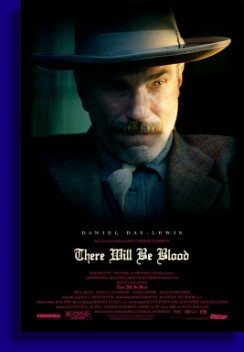 Now is ‘There will be Blood’ a good movie? It’s certainly watchable, but there are times when it seem to run long and challenged the audience to maintain interest. Though Lewis is a force in this film, sometimes you can have too much of a good thing as the singular focus on Plainview didn’t allow for the development of the supporting characters. Even H.W. and Eli Sunday, the two other principles in this film were shorted and grossly overshadowed by the story of Daniel Plainview. But as I noted earlier, Lewis performance alone makes this film a must see event. When I put that gold statue in a room and lock that door, I don’t know if Daniel Day-Lewis would be able pry it George Clooney’s grubby hands, but I like his chances.